The long gestating rivalry between Colby Covington and former UFC champion Tyron Woodley never had the chance to come to a conclusion after several attempts to put the fight together fell apart. 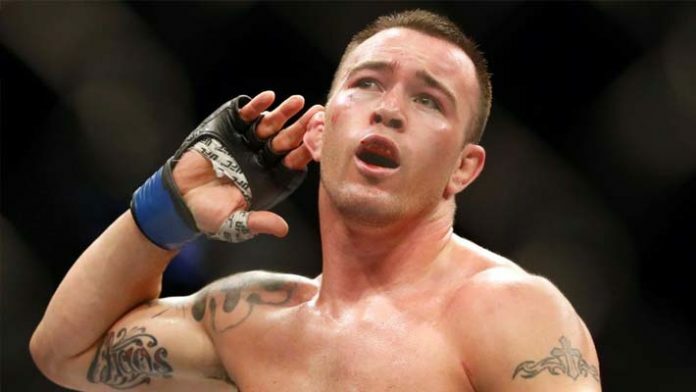 The UFC asked Covington to fight Woodley three months after becoming interim champion last June in a five round battle with Rafael dos Anjos but he was forced to decline due to pending sinus surgery. Covington then attempted to goad Woodley into a fight in November after he made quick work of Darren Till at UFC 228 but he was unable to compete that soon due to a thumb injury suffered during his title defense. Then an attempt to put the fight together in January fell apart when Woodley still wasn’t cleared to compete due to surgery on his thumb. When the UFC then asked Covington to face Kamaru Usman instead, he opted to wait for Woodley. Unfortunately, the UFC then decided to offer Woodley a fight with Usman and they ended up meeting at UFC 235 in early March. Usman ultimately won the UFC welterweight title in a lopsided unanimous decision over Woodley. While there’s obviously still a chance they could meet down the road, Covington says Woodley and the UFC blew it by not having them fight ahead of the Usman showdown because that rivalry would have culminated in a huge pay-per-view between two opponents who despised each other. “The luster is taken off of it,” Covington said about facing Woodley now. “He was this invincible guy who was claiming to be the best welterweight of all time, which we all know was complete lies cause he’s a fake f—ker. It just had so many different angles in it. The red versus blue. He’s a liberal, I’m a Republican. There’s so many different ways the fight could go. Ex-teammates, we literally hate each other, that wasn’t a fake beef. ‘Marty Snoozeman’ tried to manufacture a beef with Woodley but there was no beef there. They were actually friends, they were cool and they actually liked each other. Covington says the disdain shared with Woodley wasn’t fake hype just trying to build a fight because they genuinely hate one another. Further proof of that played out in the crowd during UFC 235 when Covington says he got into a shouting match with Woodley’s mother. “Even me and ‘Mama’ Woodley had a fight in the crowd cause all the fans were cheering ‘Colby you’re the real champ’ and I said that’s right and Mama Woodley stands up ‘oh hell no, f—k you Colby, my son’s going to knock you the f—k you’ and then Dana [White] had to come separate us and keep security by us. It was crazy,” Covington revealed. While it’s not likely that the rivalry will fade away or disappear just because Woodley is no longer champion, Covington knows the heat built up with his former teammate just won’t be the same now as it would have been if they met before he fell to Usman.